Ellen Aitken, McGill's Dean of the Faculty of Religious Studies, and former British Prime Minister. 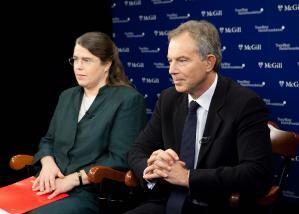 / Photo: Jerry Domian courtesy of Tony Blair Faith Foundation. McGill has become the first Canadian university – and the fourth in the world – to partner with the Tony Blair Faith Foundation’s Faith and Globalization Initiative. Blair, the former British Prime Minister, made the announcement on Thrusday along with Ellen Aitken, McGill’s Dean of the Faculty of Religious Studies in a live video press conference from Yale University. The initiative is a global network of universities committed to exploring the complex interrelationship of faith and globalization in the modern world. That excitement was shared by Aitken who said McGill’s partnership with the Foundation will provide the University with the opportunity “to build a substantial platform among various faculties and other academic units that will allow researchers to investigate the many ways in which religion has an effect on a wide array of topics of international concern. “Our involvement with this project grows out of the conviction that many at McGill share, namely that in order to exercise and insightful leadership in today’s world, it is necessary to have a level of religious literacy knowledge of the world’s religions and understanding of how religions function in the public sphere and in people’s lives,” Aitken continued. Speaking from personal experience, Blair expanded upon Aitken’s comments, highlighting how, just a generation ago, religious literacy was not the priority of many politicians. “When I first came into politics 25 years ago if you’d have asked me about relations between Shia and Sunni Muslims, Muslims and Christians, or what’s the relationship between Hindus and Buddhists – I would have looked at you blankly,” said Blair. Calling it an “energizing moment for McGill,” Aitken outlined the “four pillars” upon which the program would be built. These pillars include developing a new, multi-disciplinary course focused on questions of religion and globalization; organizing research conferences and colloquia; hosting public lectures and workshops; and making the results of these initiatives widely available through publications. Blair believes that as much as the 20th century was dominated by political ideology, the 21st century could well be defined by religious and cultural ideology. His foundation’s network of universities, which also includes Yale, the National University of Singapore and Durham University in the UK, will foster discussion on issues that are often polarizing, such as the on-going debate in France on whether to ban the burka or Switzerland’s recent referendum vote to prohibit the construction of new minarets attached to mosques. For a society to work, continued Blair, it needs “faith-friendly democracy and democracy-friendly faith. In other words, you need to allow people of different of religious views to express that point of view and to be heard. But you also need to acknowledge that there is a common space that we all have to inhabit irrespective of our different backgrounds or faiths or no faiths. That common space in a sense defines our community and society.